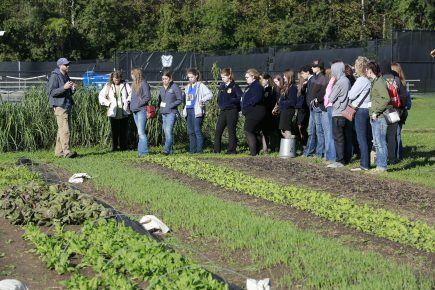 On a brisk fall Indiana Friday morning, 49 members of FFA (Future Farmers of America) got a look at a model for the future of urban agriculture. The FFA members, who came from as far away as Massachusetts and Connecticut, Arizona and Washington state to attend the annual FFA convention in Indianapolis, took a tour of the CUE Farm at Butler to see how the University is approaching sustainable, environmentally responsible urban farming. The produce grown on the farm is sold locally through a CSA group (Community Supported Agriculture), at a weekly farmstand, and to 6-10 local restaurants and grocery stores. The farm also provides students with educational opportunities. Butler students can take a class called Cultivating Well Being, where they work on the farm. Biology, Communications, and Business classes, as well as interns, also participate in farm activities. For many of the FFA visitors, the Butler farm is a postage stamp of land compared with where they live. Katherine Carpenter—Miss Washington Teen Agriculture—lives on roughly 150 acres where they grow oats, timothy, alfalfa, grass, pasture mix and other kinds of hay that thrive in Washington State. She wanted to see the farm at least in part because “it’s at a college and we’re all in high school and looking at colleges.” She said she liked what she saw. After the tour, Angstmann polled the group and found that only one member had visited an urban farm prior to this tour and two had previously seen a sustainable agriculture project. 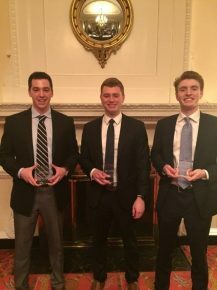 After months of research, planning, and preparation John Boudreau, Spencer Wenzloff, and Ryan Reid made their way to Louisville to compete in the local round of the CFA Institute Research Challenge in early March. The way they decided to announce their victory? Just a short, simple email with their winning trophy picture. 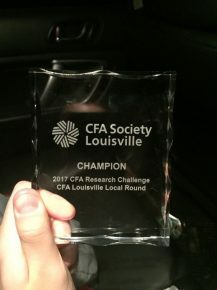 The CFA (Chartered Financial Analyst) Institute Research Challenge is an annual competition that gives students hands-on, rigorous training in financial analysis. 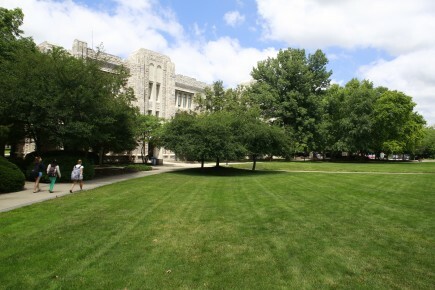 University students work in teams and are given a company to research and analyze. 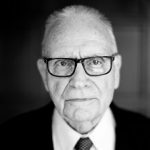 “Essentially if you were an investor, anything you would need and want to know we should be able to tell you,” Reid said. They found out about the competition in November, when their professor, Dr. Steven Dolvin, CFA, emailed his class about interest. Right away they knew who in the class would want to do the competition. Once they sat down together, the three decided to become a team and start research right away. “As we got closer, we looked at what needed to be worked on, and did a lot of problem solving,” Boudreau said. Work was divided up evenly, where they each focused on specific areas. Yet, Reid said, that didn’t stop them from being especially prepared. There were two “divisions” in the local challenge, where schools were chosen at random to compete against each other. Before the competition beganeach team sent in a detailed report. One team in each division went straight to finals. Everyone else in each division competed for one other spot. “We had a 10-minute presentation and a 10-minute Q&A session, and believe me they were incredibly strict with the cutoff,” Reid said. The team said the time limit was the most difficult part. Quickly they went over everything, and in two hours sharpened what they were going to say. Apparently, they had a secret weapon. The final decision was announced. When asked why they thought they did so well, they cited their communication. “We are friends and it is what makes us work,” Reid said. They headed to Seattle on April 7 to compete in the next level, the Americas Regional, against 52 other teams from North and South America. Although they did not advance in the competition, they were excited to participate. Boudreau said this competition has changed his life. He said he already had a job after college where he completed brokerage training, but decided to resign. He said this competition has changed his life, and what he wants to do. “I want to pursue things that are more like this,” he said. Students "brought some hardware home" from competition. Three Greek organizations interested in opening a chapter at Butler will present their proposals to the University community February 16–23, with a decision due by early March. Beta Theta Pi will present on February 16 from 4:15–5:15 PM in Jordan Hall, Room 141. Pi Kappa Alpha will follow on February 20 from 5:30–6:30 PM in Jordan Hall, Room 141. Theta Chi will follow on February 23 from 4:00–5:00 PM in Jordan Hall, Room 141. Beta Theta Pi was founded in 1839 at Miami (Ohio) University and has 137 chapters and 26 colonies in the United States and Canada. Pi Kappa Alpha was founded in 1868 at the University of Virginia and has a total of more than 220 chapters and colonies across the United States and Canada. Theta Chi was founded in 1856 at Norwich University in Norwich, Vermont. It has 235 chapters. Anne Flaherty, Interim Vice President for Student Affairs, and Becky Druetzler, Director of Greek Life, said the University is committed to working with the organization selected to obtain housing. Butler requires that any organization invited to establish a chapter provides housing within 2–4 years. 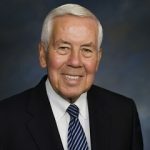 The selection process began in January 2016 when the University contacted 25 national fraternities that had previously expressed interest in Butler's fraternity and sorority community. A committee of staff, students, alumni, and faculty reviewed eight extensive proposals and recommended the three finalists. 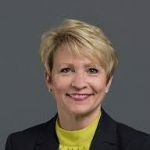 A University trustee will be joining the committee for consideration of the three finalists. The committee will makes its recommendation to the President. The last time a chapter was established as a new initiative and not a recolonization was Phi Kappa Psi in 1971. Phi Delta Theta was recolonized in 2008–2009. Three Greek organizations interested in opening a chapter at Butler will present their proposals to the University community.